The orrery is a mechanical model of the solar system, used to show the relative position of planets over time. However, this “orrery” is used to show the position of world-views, forcing the viewers to look at the world from someone else’s perspective. 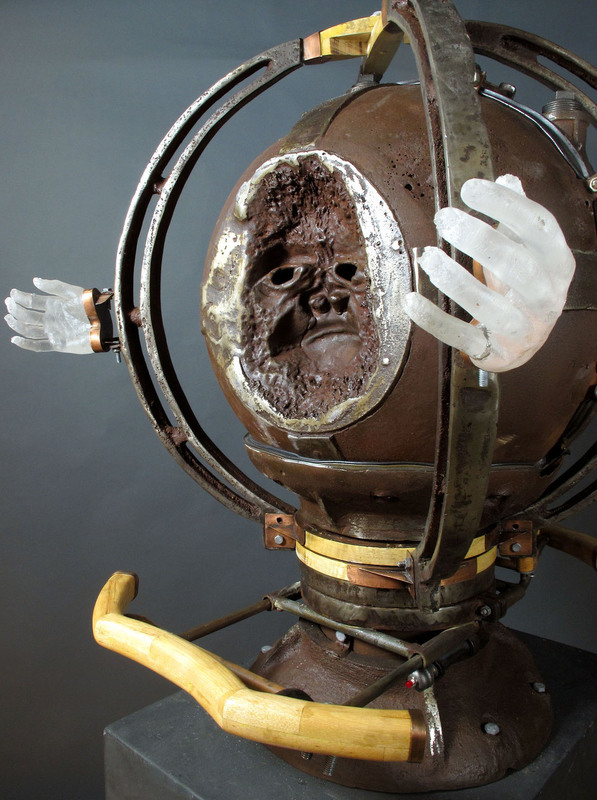 The cast iron sphere has an ape’s face on one side, and a man’s on the other. Viewers can look through the a face’s eyes, seeing the other from another point of view. However, rather than a voyeuristic experience, I want the experience of looking through someone else’s eyes to be intimidating and uncomfortable. In order to look throughout the eyeholes, the viewers must allow glass hands close around their heads heads, making them captives, rather than voyeurs.